Guillermo del Toro’s films are very much like Tim Burton’s films: there’s a distinctive feel and style to them that sets them apart from other films. A tendency towards the strange and the dark, creatures not oft experienced by man nor treated that much in modern fiction, etc. And such is the case with his latest venture, The Shape of Water, which del Toro says was inspired by when he saw Creature from the Black Lagoon as a kid and was disappointed that it wasn’t a romance between the Creature and Julie Adams. I have to say, all these decades later, the concept has aged well. The Shape of Water follows Elisa, a mute custodian at a government facility in Baltimore in 1962. One day, the facility receives an amphibian-man creature from South America, which is kept in a room that Elisa cleans. The two start interacting and romancing, leading to a plot to save the creature from the facility and those who would do him harm. There’s a lot going for this film. For one thing, it’s beautiful. Everything from the sets to the costumes looks right out of the late 50’s, early 60’s, the lighting is used in different ways to highlight moods and atmosphere, and there are even throwbacks to classic films from that period, including a short musical number that I feel like was inspired by the ones American Horror Story does every couple of seasons. The acting is also pretty stellar: Sally Hawkins as Elisa is wonderfully expressive through facial expressions, body language, and sign language. Octavia Spencer (can that woman do no wrong?) and Richard Jenkins as Zelda and Giles, Elisa’s friends, are full of pathos and charm. And Michael Shannon as the antagonist Strickland, while feeling like a hammy caricature at times, is entertaining to watch on screen. And oh my God, the make-up on the Amphibian Man (which is his listed name in the movie, I checked). That is award-winning stuff. It looks so real, and as far as I know, mainly CGI-free. That’s really impressive. All that being said, there were a couple of issues I had with the film. For one, once you kind of understand what sort of film you’re watching, you can kind of guess the plot. It’s been done before, though not with Amphibian Men. So if you can guess the story archetype, you probably will guess where the story is going to go. There’s also this theme of tolerance and the difficulties of otherness that pervades the film, which you would expect. There’s the Amphibian Man, which isn’t even human. Elisa is mute, Zelda is black, and Giles is gay. Obviously, the filmmakers are going to bring this up. And I’m not opposed to that, I love stories that explore the difficulties of being on the outside for no other reason than being who you are. The problem is, the theme is handled differently from scene to scene. In some scenes, like a scene midway through the movie at a diner, it’s handled very well. But at other times, the handling feels kind of clumsy, which kind of brings down the impact of the theme. Regardless, this is a wonderful film. If you’re going in for a science-fiction/horror story, you won’t get that. But if you go in for a visually appealing and well-done love story with some sci-fi elements, you’ll end up getting your money’s worth at the theater. 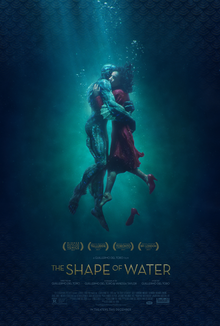 On a scale of 1 to 5, I give The Shape of Water a 3.8. Take a dip into a strange new world, and see for yourself if there’s something to love here. Now if only del Toro could do an adaptation of At the Mountains of Madness, which he tried to do a few years ago (but only after I’ve read that particular HP Lovecraft story). That would be awesome.